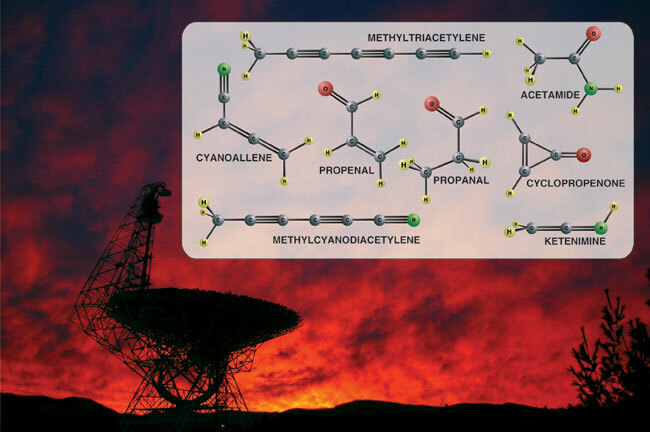 In just two years of work, an international research team has discovered eight new complex, biologically-significant molecules in interstellar space using the National Science Foundation's Robert C. Byrd Green Bank Telescope (GBT) in West Virginia. "This is a feat unprecedented in the 35-year history of searching for complex molecules in space and suggests that a universal prebiotic chemistry is at work," said Jan M. Hollis of the NASA Goddard Space Flight Center, leader of the research team. The new discoveries are helping scientists unlock the secrets of how the molecular precursors to life can form in the giant clouds of gas and dust in which stars and planets are born. "The first of the many chemical processes that ultimately led to life on Earth probably took place even before our planet was formed. The GBT has taken the leading role in exploring the origin of biomolecules in interstellar clouds," said Phil Jewell of the National Radio Astronomy Observatory (NRAO). The eight new molecules discovered with the GBT bring the total to 141 different molecular species found in interstellar space. About 90 percent of those interstellar molecules contain carbon, which is required for a molecule to be classified as organic. The newly-discovered molecules all contain carbon and are composed of 6 to 11 atoms each. These results suggest, the scientists say, that chemical evolution occurs routinely in the gas and dust from which stars and planets eventually are born. The mass of an interstellar cloud is 99 percent gas and one percent dust. 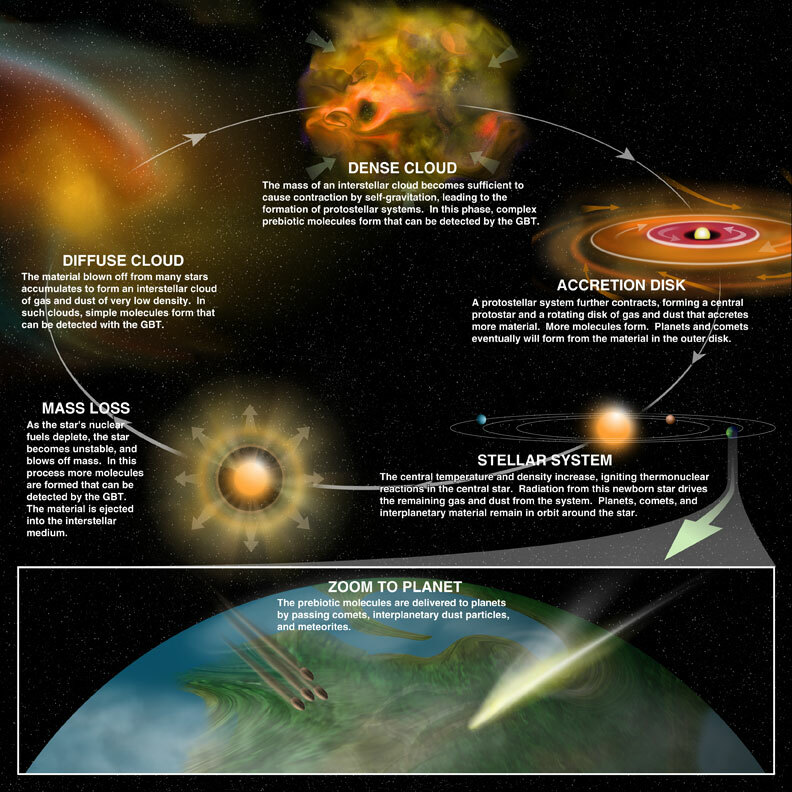 The GBT discoveries have been made in just two prototypical interstellar clouds. The molecules acetamide (CH3CONH2), cyclopropenone (H2C3O), propenal (CH2CHCHO), propanal (CH3CH2CHO), and ketenimine (CH2CNH) were found in a cloud called Sagittarius B2(N), which is near the center of our Milky Way Galaxy some 26,000 light years from Earth. This star-forming region is the largest repository of complex interstellar molecules known. The molecules methyl-cyano-diacetylene (CH3C5N), methyl-triacetylene (CH3C6H), and cyanoallene (CH2CCHCN) were found in the Taurus Molecular Cloud (TMC-1), which is relatively nearby at a distance of 450 light years. The starless TMC-1 cloud is dark and cold with a temperature of only 10 degrees above absolute zero and may eventually evolve into a star-forming region. "The discovery of these large organic molecules in the coldest regions of the interstellar medium has certainly changed the belief that large organic molecules would only have their origins in hot molecular cores. It has forced us to rethink the paradigms of interstellar chemistry," said Anthony Remijan of the NRAO. These large molecules found with the GBT are built up from smaller ones, the scientists say, by two principal mechanisms. In the first, simple chemical reactions add an atom to a molecular structure residing on the surface of a dust grain. As an example of this process, the researchers cite a molecule called cyclopropenylidene (c-C3H2, where "c-" means cyclic), which contains three carbon atoms in a ring. Cyclopropenylidene was discovered in interstellar space in 1987, and is known to be highly reactive. In 2005, using the GBT, scientists discovered another molecule, cyclopropenone (c-H2C3O), which can be produced by adding an oxygen atom to cyclopropenylidene. The second method for constructing larger molecules from smaller ones involves neutral-radical reactions that can occur within the gas in an interstellar cloud. For example, in 2006, the scientists discovered acetamide (CH3CONH2), which can be formed when a previously-discovered neutral molecule called formamide (HCONH2) combines with radicals such as CH2 and CH3, also previously discovered. Acetamide is particularly interesting because it contains a peptide bond which is the means for linking amino acids together to form proteins. Once interstellar molecules are ejected from dust grains into the gas phase, presumably by shock waves, they are free to rotate end-over-end. As gas molecules change their rotational modes, they can emit or absorb radiation at precise radio frequencies, called transitions, that are unique to each type of molecule. By detecting several rotational transitions, astronomers can unambiguously identify a specific interstellar molecule. "It is important to note that likely interstellar molecule candidates are first studied in gas-phase laboratory experiments so that transition frequencies are known in advance of an interstellar experiment," said Frank Lovas of the National Institute of Standards and Technology. Along the line of sight from the interstellar cloud to the telescope, thousands of billions of molecules undergo the exact same transition, producing a signal strong enough to be detected by sensitive equipment. For this type of work, the GBT is the world's most sensitive tool that can be accurately pointed and track astronomical objects. In addition to Hollis, Jewell, Remijan, and Lovas, the research team included Lewis Snyder of the University of Illinois; Harald Mollendal of the University of Oslo, Norway; Vadim Ilyushin of the Institute of Radio Astronomy of the National Academy of Sciences of the Ukraine; and Isabell Kleiner of the Universite Paris, France. The astronomers' reports on their results appeared in 8 separate editions of the Astrophysical Journal.